Automotive OEMs are constantly looking for ways to make manufacturing more efficiently while producing a better vehicle. Use of the cloud-runner can provide valuable feedback when evaluating new paint processes and paint formulations for the presence of mottle or striping. Mottling is an undesirable defect which can occur with effect coatings – it is most obvious on light metallic finishes and especially noticeable on large body panels. Mottling. Photo Courtesy of BYK-Gardner. The cloud-runner rolls over a painted surface and measures the amount of lightness variation using three observation angles—15°, 45° and 60°. The data are then processed using mathematical filters, which separates the information into specific mottle or cloud sizes ranging from 6mm to 200 mm. 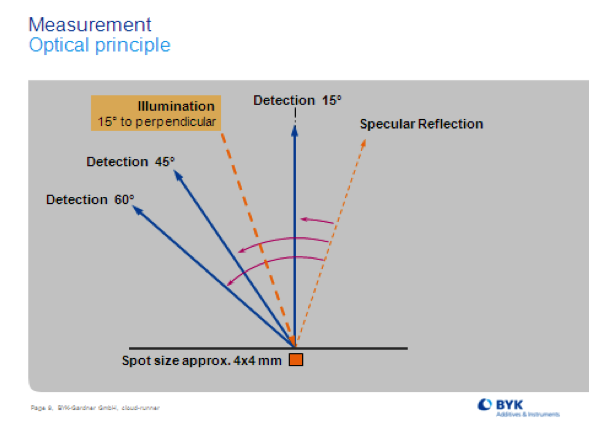 Optical Principle of Measuring Mottling. Photo Courtesy of BYK-Gardner. 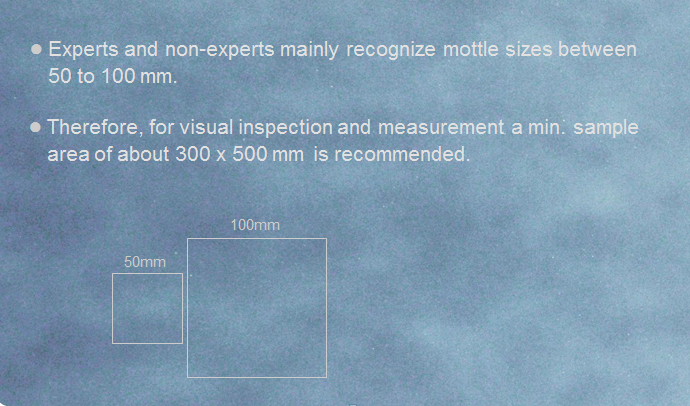 Possible causes of mottle include flake orientation or film build variation. Disorientation of the flake is usually evident on the 15° angle. The variation in thickness resulting in partial hiding would be most evident on the 45° and 60° angles. 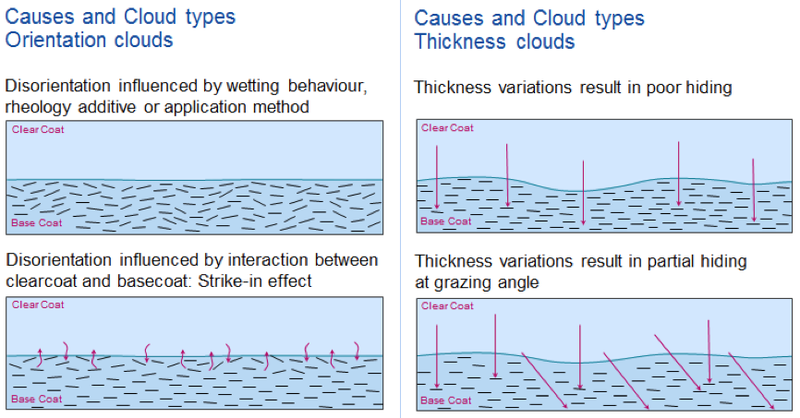 Causes on Cloud Types. Photo Courtesy of BYK-Gardner. Through use of the cloud-runner, instrumental evaluations of painted surfaces can be performed and optimal process parameters derived based on the measurement results. Recently, a study was conducted to determine process parameters for a paint application. Data table of process parameters. Table Courtesy of BYK-Gardner. 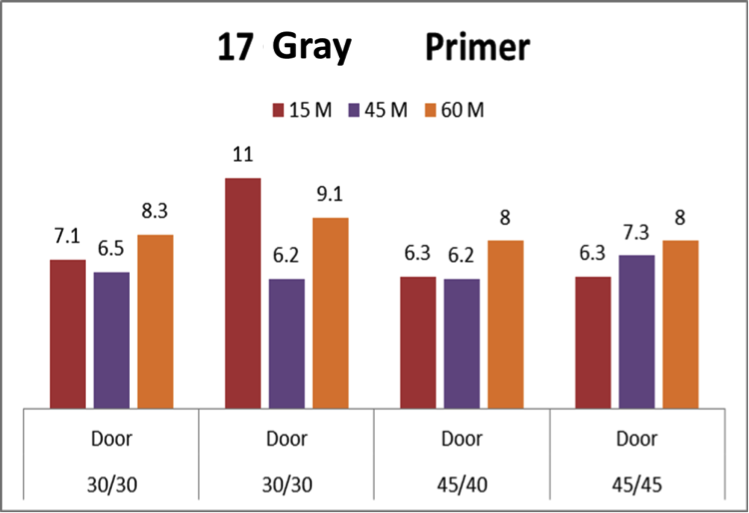 The data for the gray primer was collected for measurement areas and compared for one primer and different processing conditions. Mottling Evaluation on a Gray Primer. Photo Courtesy of BYK-Gardner. The data were compared for all measurement locations. Based on those results, the optimized conditions for minimal mottling based on the parameters evaluated for the gray primer were 45 atm and 40 fan. The increase in the mottling number on the 45° and 60° angles for the gray primer with process conditions of 45 atm and 45 fan indicates that the coating is exhibiting inconsistencies at the grazing angles. The data generated also resulted in future development work to better understand the coatings behavior and application process. Some of the items to consider included: 1) understand film build for all measurement locations, 2) complete a trial of an entire vehicle with the optimal process parameters to allow for full vehicle and side-to-side variations. The cloud-runner has proven to be a valuable tool for both process optimization and material development. Bill Foran is an Business Line Manager for Automotive at BYK-Gardner USA. For more information on the BYK-Gardner cloud-runner, click here.